I dozed in and out of sleep. Part excitement, part worry, part trying to distinguish between the snoring from the tent next to us and the vocal hyenas that were circling camp. “Did you hear THAT?” I shook Pete by his shoulder. We would learn later that it was a hyena calling for reinforcements, recognizing that predators were nearby. In the morning, as we drank coffee in sight of a tower of giraffes, others recalled hearing lions roar. Somehow we had miraculously slept through that and I was deeply disappointed. I wanted to hear it all. I wanted lions circling and sniffing our tents, I wanted to actually shudder with the fear of having them too close. 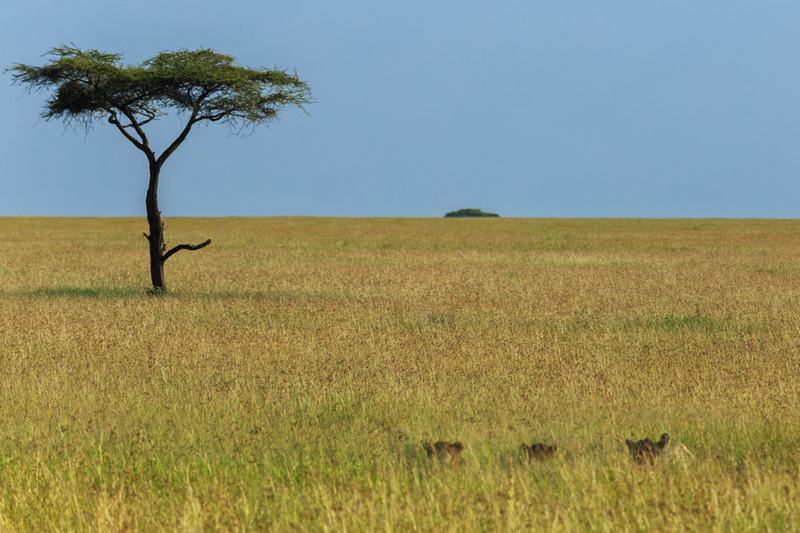 I wanted lions circling and sniffing our tents, I wanted to actually shudder with the fear of having them too close. 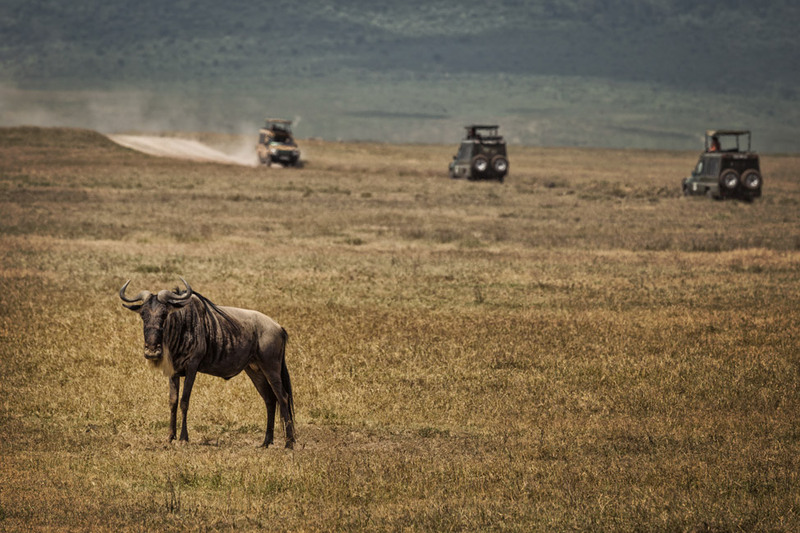 The large size of our tent and vehicle that we drove for three days through the Ngorongoro Crater and the Serengeti National Park meant that we would be safe as long as we were in them. Stray, and we could become prey. That meant being confined for long days on bumpy roads, and not drinking anything after the early evening so that I wouldn’t have to rise in the middle of the night to visit the bathroom a good distance away. If I had to, instructions were to flash a light in all directions in the dark around me. If the light reflected on a set of eyes, then retreat to the tent. 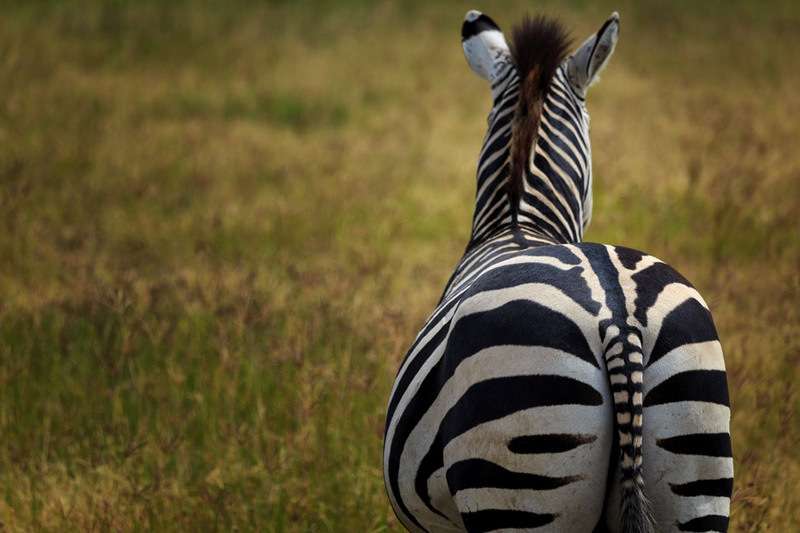 As much as I wanted to feel a real part of the Serengeti, I’m not stupid. I kept my bladder in check and the tent fully zipped until the sun broke the horizon. I settled for instead trying to blindly identify the noises that raged on around me. Such was our three days in this, one of the wildest environments that may exist on the planet. Where we were forced into our cages of tent and jeep in order to survey our environment. This was so unlike any of our previous animal experiences, where it was always the other way around. And we couldn’t get enough. If the light reflected on a set of eyes, then retreat to the tent. If there is a more perfect microcosm of Africa on the continent, I cannot imagine. For within this deep volcanic crater that is only 20 kms across there is nearly every species we wished to encounter. The big five (lion, elephant, rhino, leopard, buffalo) are all present and almost every other animal that screams Africa, save for giraffes and some antelope, given that their spindly legs make it difficult to navigate the steep crater rim. They’re all right there. Drive just a few minutes in order to encounter a few new animals. 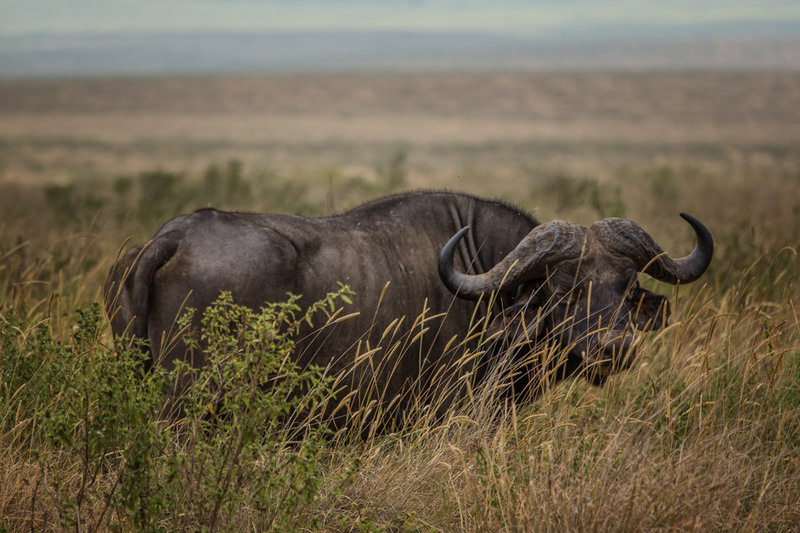 Water buffalo were the first we saw, their giant dark frames easy to spot from a distance. 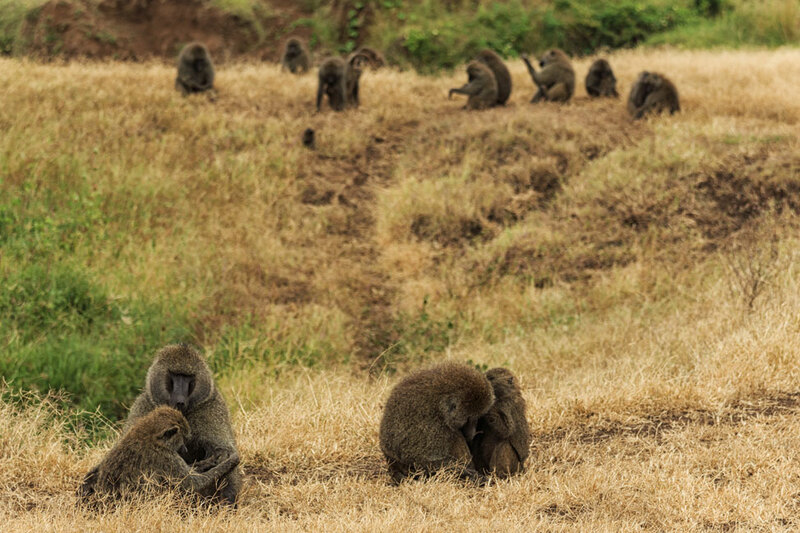 Then zebras (or zebbies as our guide Isaya adorably called them), a massive congress of baboons grooming each other, lazy hippos rolling in marshy waters, and then onto one of the main attractions. “Can you smell that?” Isaya teased, grinning from ear to ear. There was no odour but he knew what was coming – around a corner and at a bend in a small river, a pride of lions spread out lazily along its edge. We fussed and squealed until we found a good spot to park among the other vehicles. Camera shutters snapped furiously and we gasped every time one moved ever so slightly. If there is a more perfect microcosm of Africa on the continent, I cannot imagine. There were 14 of them, which seemed unfathomable, having arrived with the expectation to see only one or two if we were fortunate. 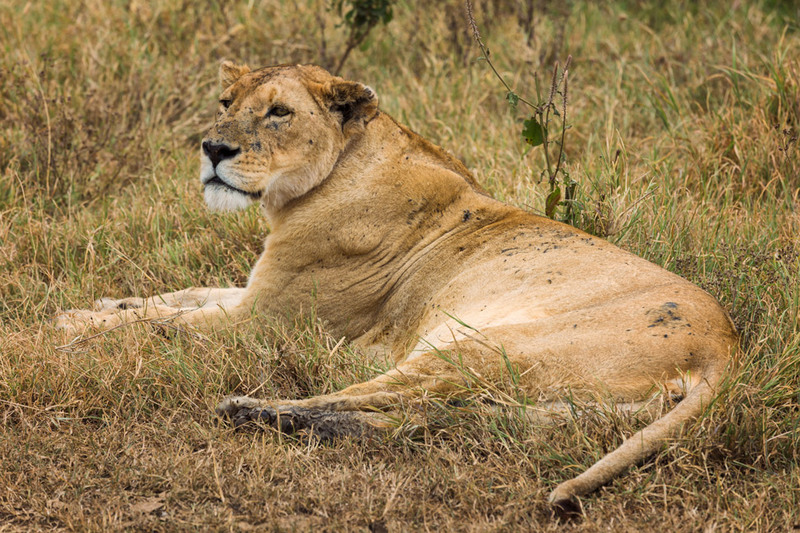 (We would learn later that our luck with lions was substantial – someone on our tour counted 85 overall.) We were hesitant to move on but knew we must, regulation of the crater meant that we had to be in and out in just a few hours. We had no time to be disappointed. We saw elephants with tusks that swept the ground, plenty of warthogs (did you know that their Disney name of Pumba actually means stupid? ), and a rare black rhino off in the distance laying on its side. We waited for him to stand and even came back after lunch to see if he had moved, but in the hot afternoon he barely stirred. 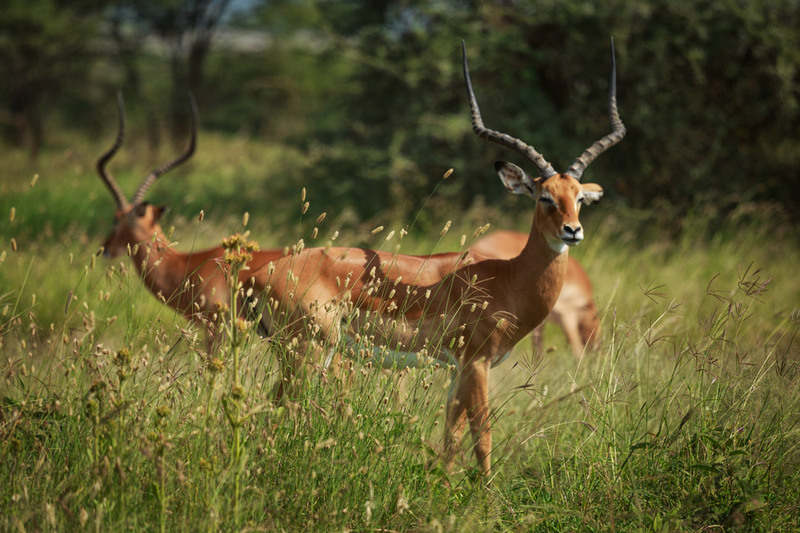 We moved onto more hippos, the Thomson’s gazelle (which was the favourite of our guide for their playfulness and speed), and the homely but fascinating wildebeests. 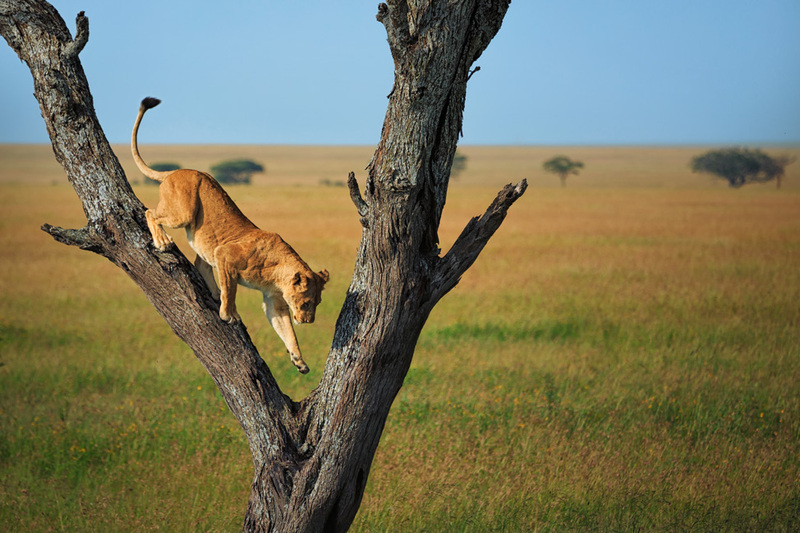 Not only does every animal need to be wary of the seven prides of lions present (our guide referred to the crater as the “lion’s supermarket”), but they also need to contend with the hierarchy of their own kind. And as we began our way out of the crater, our drive slowed to a crawl. Wildebeests were dancing around us. Or rutting, as it is more aptly called. 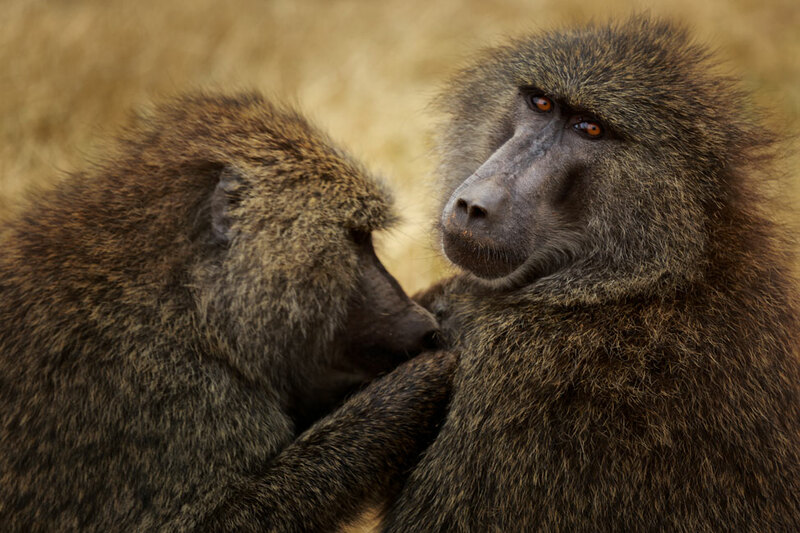 Solitary males, trying to control large herds of females in order to improve their chances of mating, must fend off the others who threaten to steal their ladies. Several large groups milled around us while the territorial males ran back and forth, guarding against an advance. They sometimes came to blows. It would start with pawing the ground and snorting. Then the males would drop to their combat positions – on their knees a few feet apart, ramming their heads at the base of the horns. Never would they appear to severely injure each other, either the territorial male wouldn’t give up ground or the challenger swept past to section off a few females for his own. And then it would begin again, males would face off mere meters from our jeep. “It’s fight hour!” I declared, not knowing at all what I was talking about. 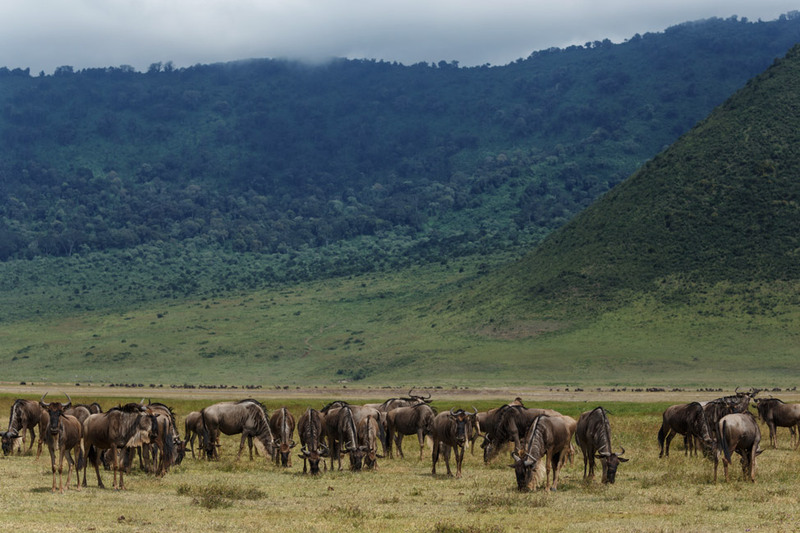 We finally moved on to catch up with the others, but the wildebeests would continue this ritual for weeks to come. “It’s fight hour!” I declared, not knowing at all what I was talking about. We left the crater believing that our trip had peaked, that there was no possible way Tanzania could get any better. 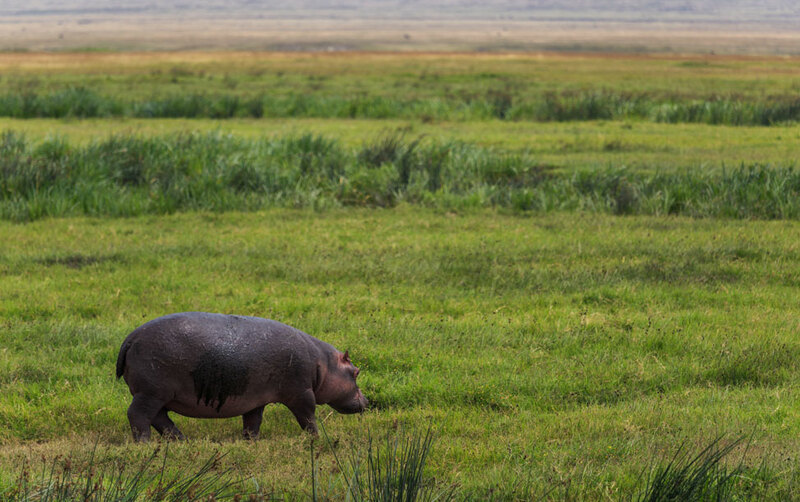 But on our first few kilometres into the sprawling expanse of the Serengeti National Park, we were greeted by an unlikely sight. And when our guide, who does this trip regularly, took out his camera and began recording the scene in total awe, we knew we were seeing something special. 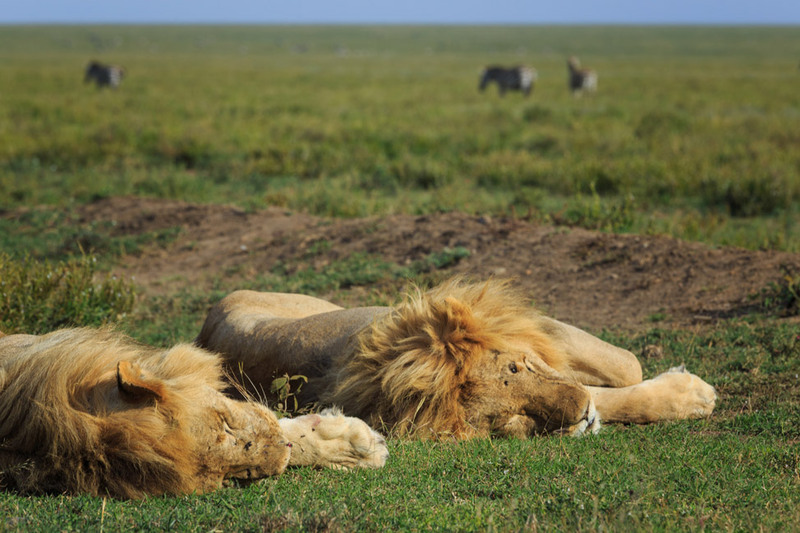 Three male lions were stretched out just beside the road. 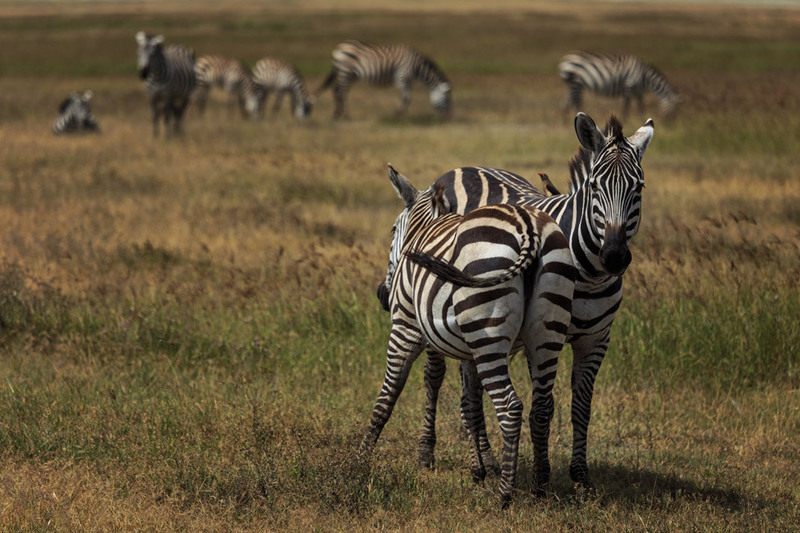 They barely acknowledged our presence, nor the zeal of zebbies spread out around them. Further on, more lions. 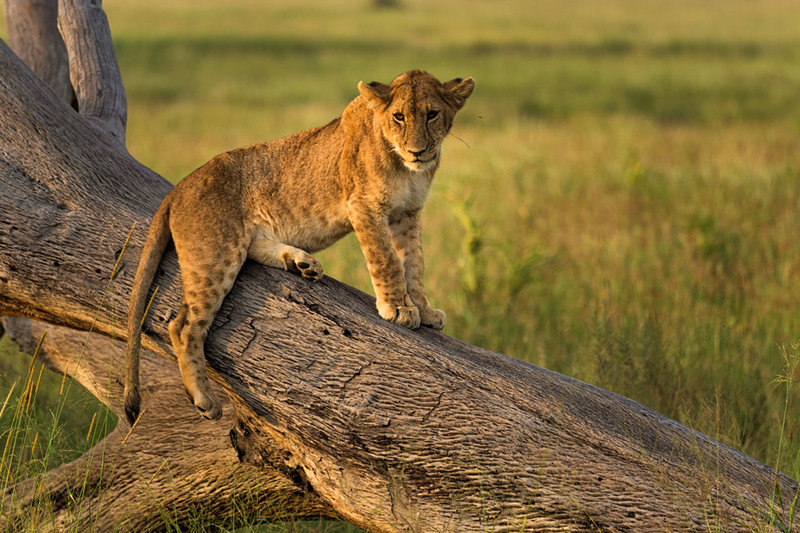 One male perched up on a rock a la Lion King, and another pride included one cub stretched across a dead branch. His rich fur shined in the golden hour sun. We ate dinner by lamplight, but not too close to the brightness, in order to avoid the giant moths that swirled around our heads. 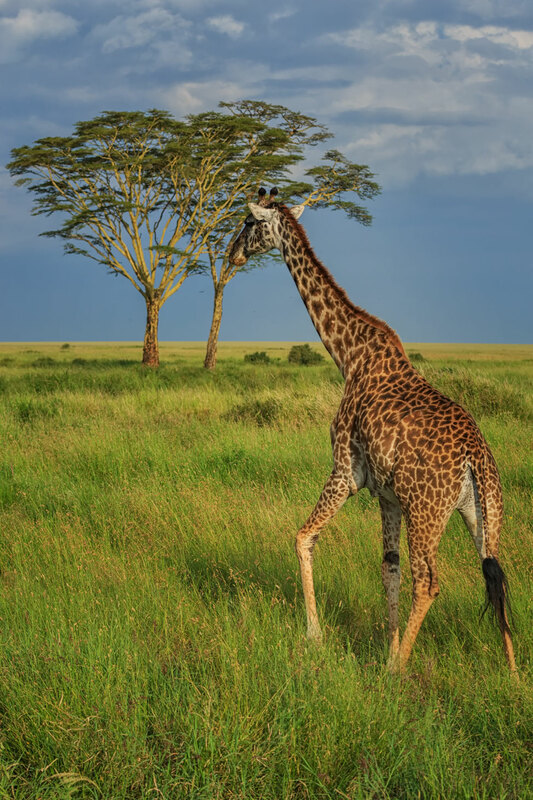 Giraffes greeted us each morning, dining on leaves from the high branches just beyond our camp. Nothing in Africa comes in size small. For two full days we crawled over just a tiny portion of the massive park. And after that much time spent with a few relative strangers cramped in a dusty jeep, you would think that it would be something to tire of. 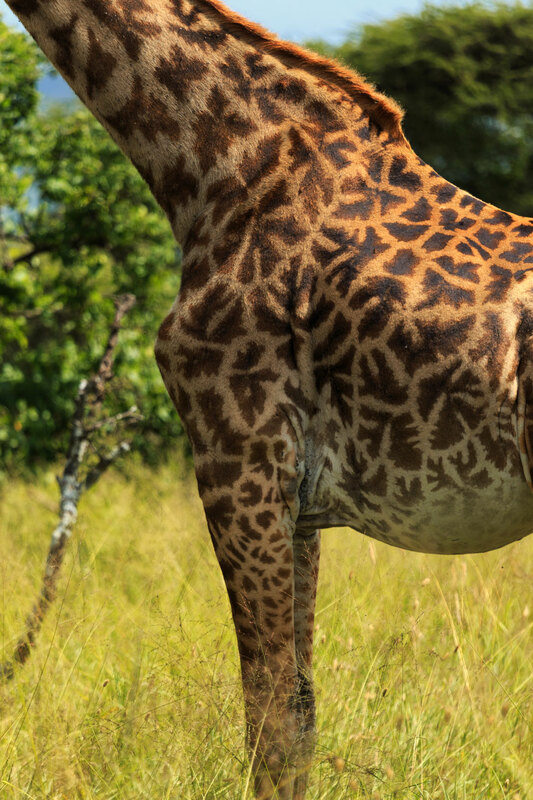 You would think that lion after lion after giraffe after hippo might lose their appeal. You might even think that I would have had my fill of African wildlife for awhile, especially after a large dung beetle flew into our moving jeep to hit me square in the throat, and after a blue ball monkey (real thing) snuck onto our open roof and threatened to jump onto my head before my screams turned him away. You might think that I had had enough. You would think wrong. And after we emerged from the park, tired, cramped, and dirty, I wasn’t alone. Our entire tour group unanimously tried to cajole the guides into just taking us back. But there was more of Tanzania we had yet to see. 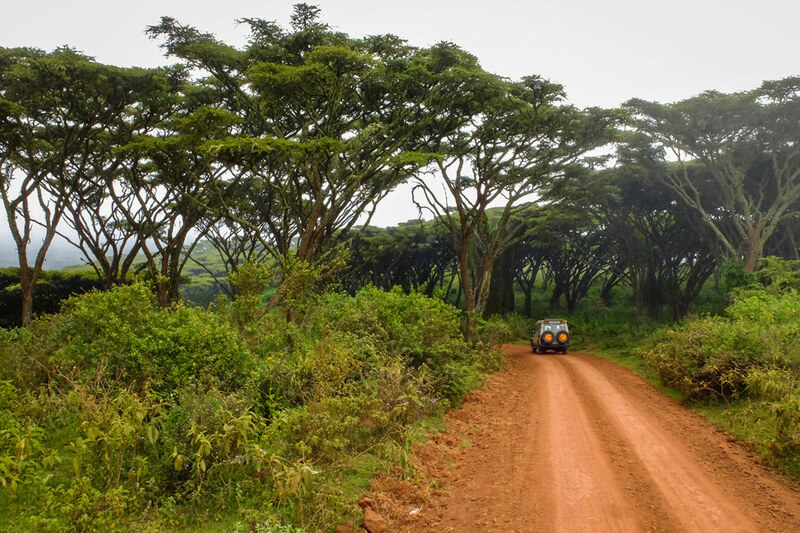 Our drives through the Ngorongoro Crater and Serengeti National Park were the most unforgettable parts of our Road to Zanzibar tour with Intrepid Travel. 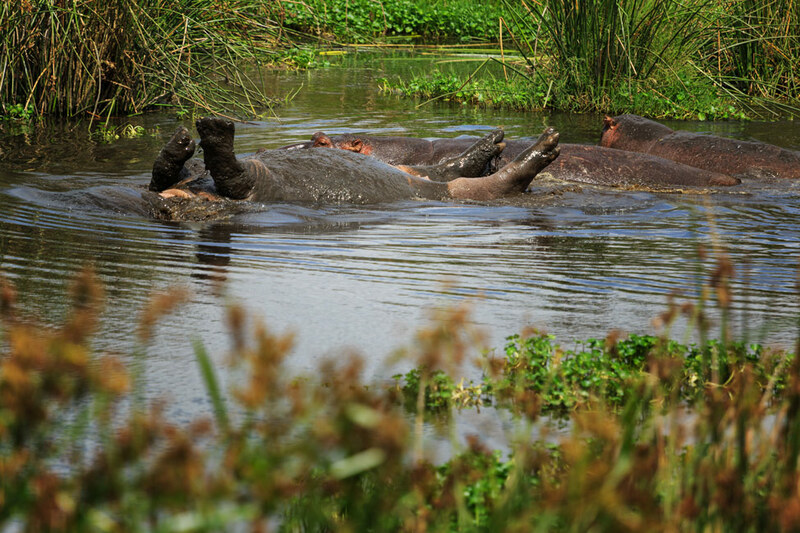 There are, of course, more luxurious ways to experience safaris throughout the region and Africa. But the thrill of staying in that basic camp in the middle of the park will, without a doubt, go down as one of the most memorable experiences we’ve ever had. We didn't expect much, and were aptly blown away. It really was! And thank you! I never realized how lucky we were until we started talking to others after. SO LUCKY. And to see a rhino, and even a jaguar! Incredible experience. Beautiful photos! I’m actually going to be on the same trip with Intrepid in late December/January. After reading your post, I am SUPER excited for this experience. I am sure you will adore it Lisa! One tip – convince your group and guides to bypass the night in Dar and go straight to Zanzibar. It only makes that travel day slightly longer and more time on the island is awesome! Will have to take you there Mom! As soon as I finished reading this I looked up Intrepid’s trip to Africa. What absolutely stunning pictures and storytelling! 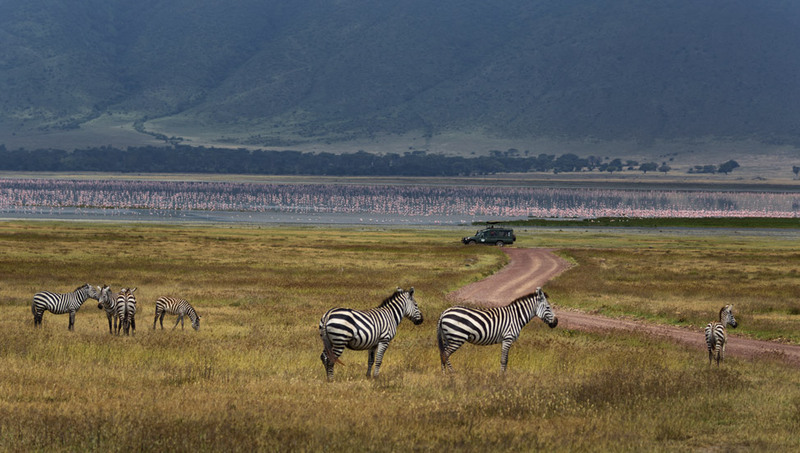 This entire post is the reason I really, really, REALLY want to go to Serengeti and Ngorongoro crater. One day… One day I will. Thank you for sharing such beautiful words and photos! 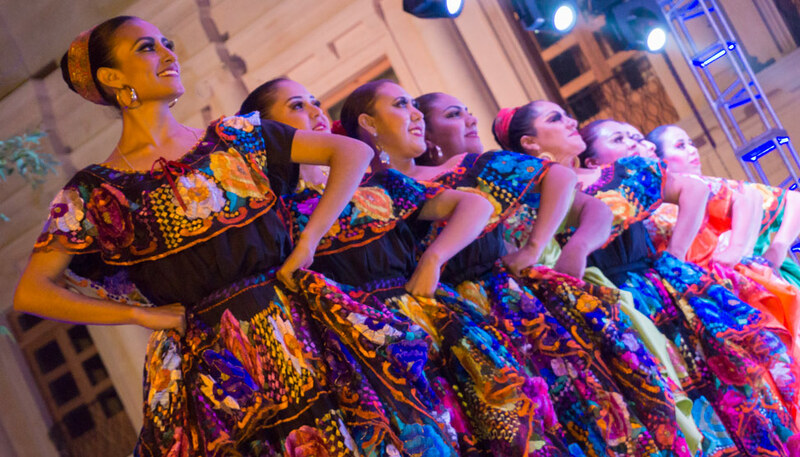 Wow – what an incredible experience, and stunning photos. So glad you got to do that! Us too! And thank you Wynne! I’m pretty much drooling now. Can’t WAIT to go to Africa next year! Hearing how exciting each and every day was makes me sure I’m going to love it – I’m even willing to camp for it, which is not something I ever thought I would be saying! Amazing. Truly. 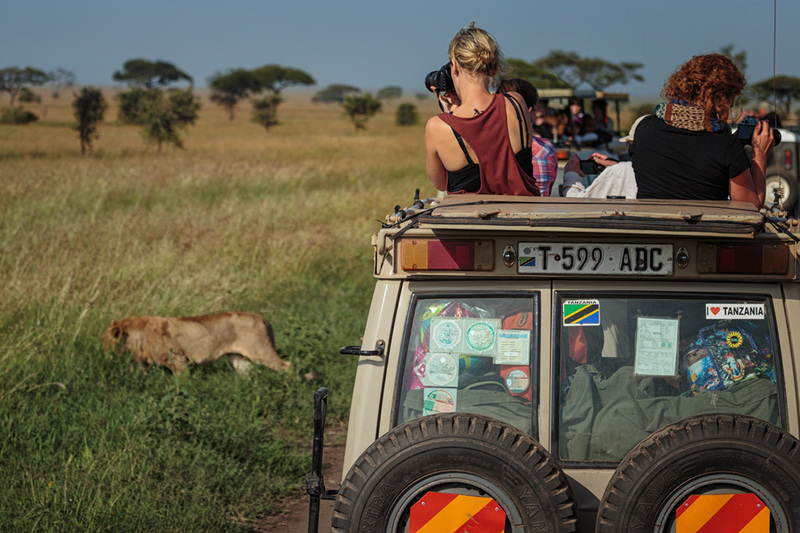 A safari in the Serengeti has always been on my wish list, but your photos and all the precious moments you captured sealed the deal. Incredible photos guys. 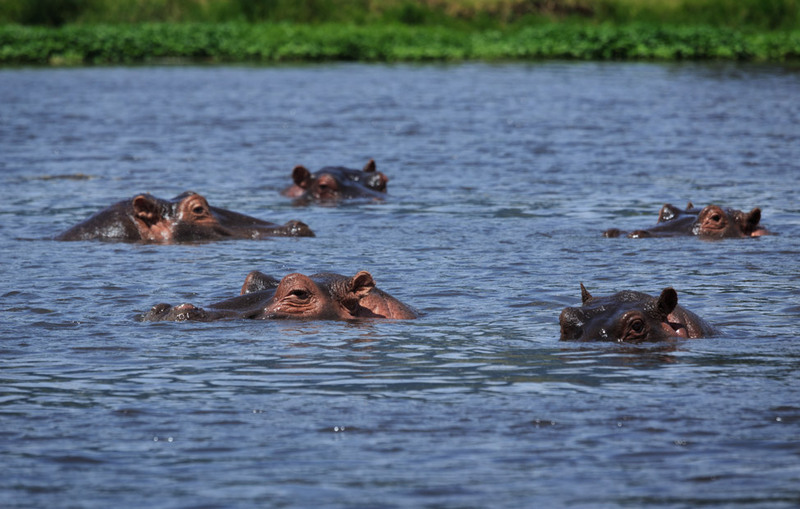 We’ve never had a huge urge to put Africa high on our “see” list, but these photos have seriously made me want to go there ASAP. Amazing! What a fabulous story! 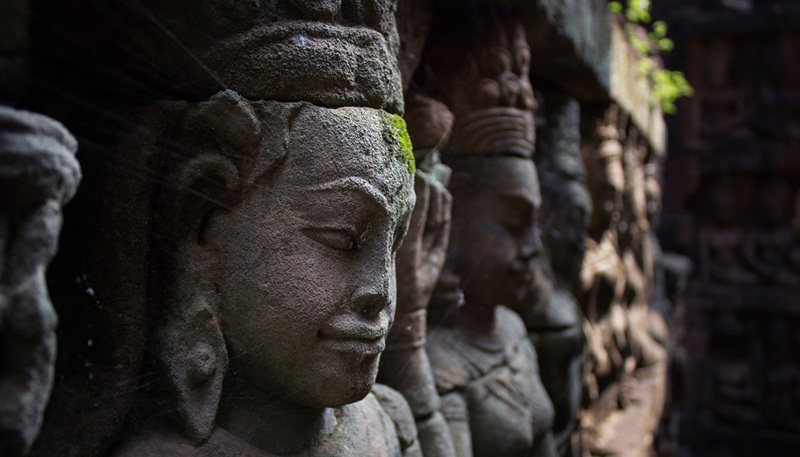 (Gorgeous writing – which we REALLY enjoy and appreciate; so many travel blogs are not written well.) And what fabulous photos! (Love the upside down hippo with his feet in the air.) 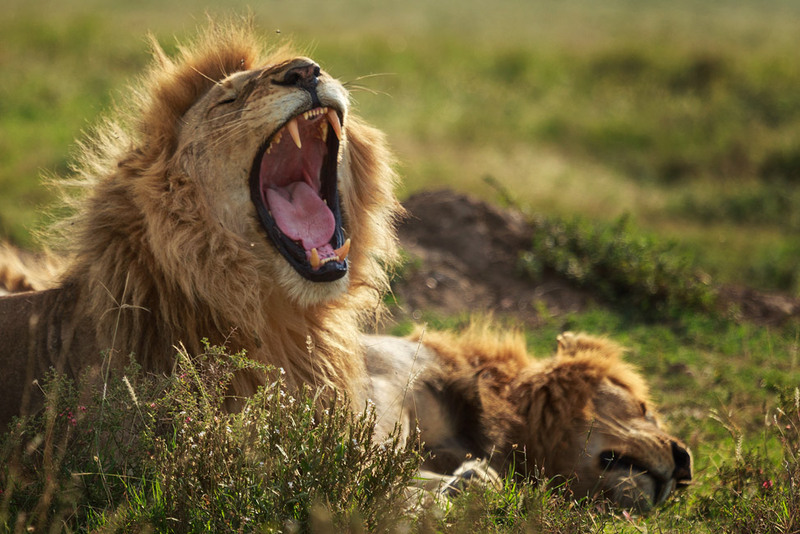 We would be stoked to return to Africa and listen to lions roar at night again. 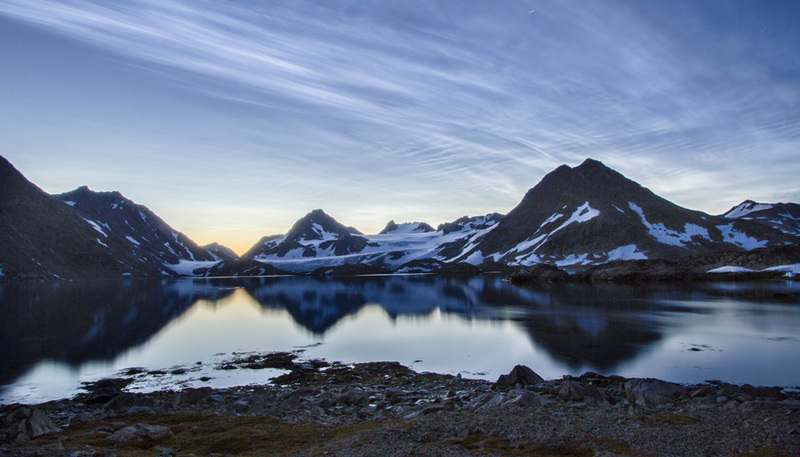 Very interesting – you note that staying in your tent at night meant you’d be safe. 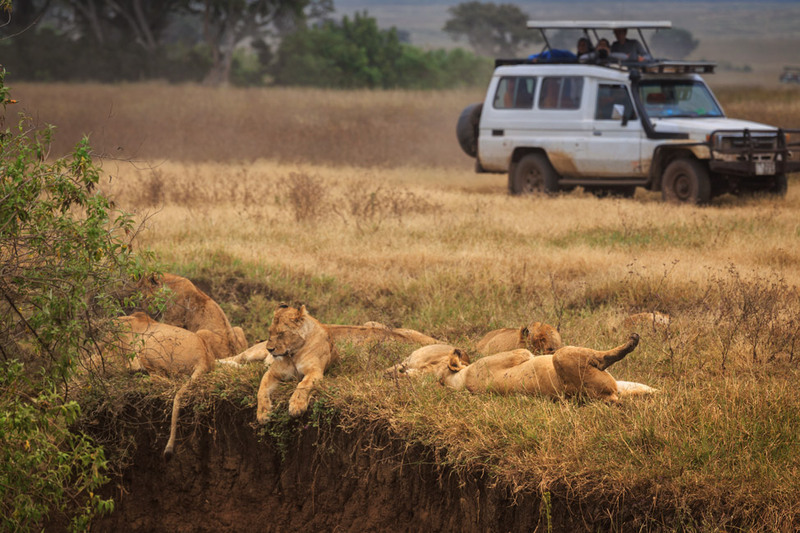 We knew that lions are habituated to the sight of people sitting down in a Land Rover (and will allow you to get right up close to them this way). But if you stand up – bad news. And VERY bad news if you get out of your vehicle and walk near them. But we didn’t know that lions must also be habituated to the sight of a tent, and thus you can sleep safely inside without being attacked. This really brought back memories! What an amazing trip you had and wonderful pictures too! A few years ago I volunteered at a reserve in South Africa and found myself sleeping in a tent listening to the calls of the hyenas and lions. 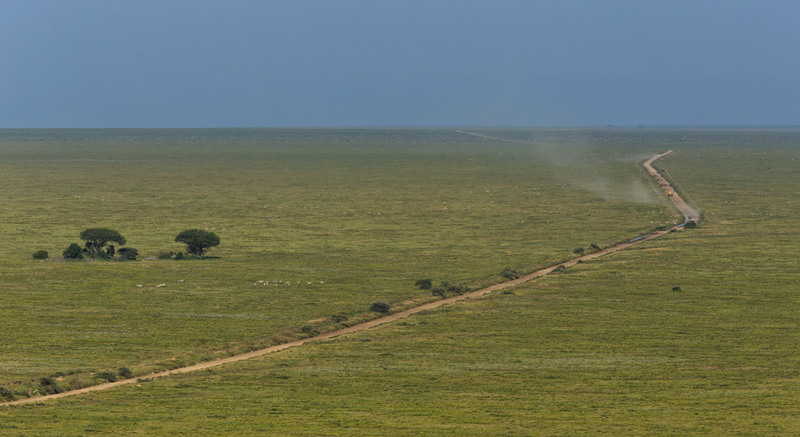 Every morning we would wake up and see the tracks of the nearby hyena clan around our camp. I tried so hard to empty my bladder before going to sleep, but as it happens, almost every night I had to get up and go at some point. I think that might have been the most stressful part of the whole trip! Thank you for this post, we did the same trip in 2013. It was so wonderful and I lived it all over again reading this post and enjoying your lovely photos. Wow, wow, wow. It is hard to find more words! I can’t believe the incredible breadth and number of wildlife you saw!! I’ve done a safari in South Africa but this is on another level. Which month did you travel in? We were there in June! 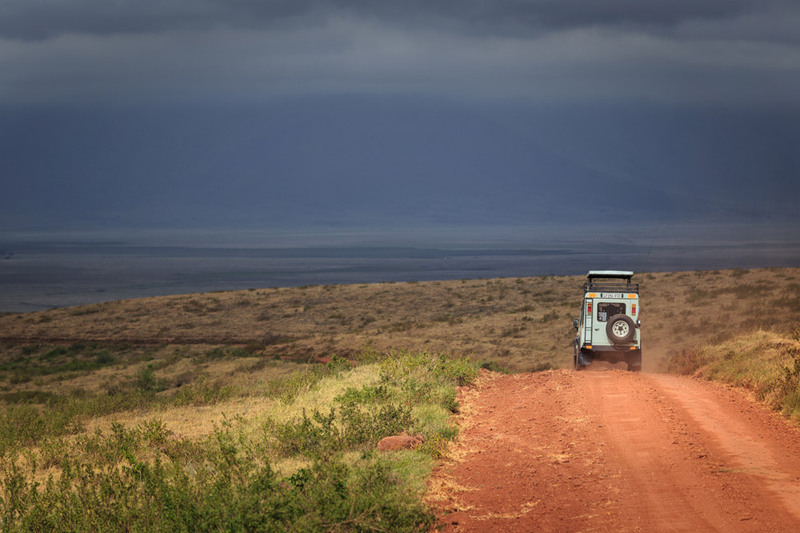 Amazing Post i always love to read posts about safari this incredible experience’s!!! Magnificent photos and writing! Can I ask how large a zoom you were using? Fantastic photos, simply fantastic !! Wasn’t Africa a real charmer?! We were in Africa four times(!) last year and I just keep counting the days until we’ll be able to go back (which is going to be in September, I think). Tanzania was my first country in Africa and I’ll remember it for the rest of my life as I also especially will remember encountering the mountain gorillas in Uganda in last June. That’s one of those things I’d recommend for everyone to do at least once in a lifetime! Also, Uganda was extremely beautiful and versatile. Wow, those pictures of lions are absolutely stunning! especially the first one! Can you share what camera and lens you are using this get those shots?